Doug: I have been on both sides of the leadership scenario you describe and have had some victories and have made some pretty big mistakes. I remember one situation where I was new in a leadership position and had a substantial project to get done under great pressure. The people who were truly on my team allowed me both the freedom to ask a lot of them and the leeway to make mistakes. The challenge came with people who joined the team later, after the project had momentum. It seems I failed to see the difference between these groups of people, those who were committedly, “on the team” and those who had just arrived. It seems that there is a factor of leadership effectiveness that has to do with the relationship between people. In your opinion, is it trust? How does one come into a last minute leadership position, or add new members to the team and have what it takes to be able to generate high performance? Allan: People joining an existing team can present a problem if they are not integrated effectively. Presumably, there was a meeting at the beginning of the project where each team member and the leader made commitments to produce the project’s end result and to each other’s commitments (like being able to take vacation, not working more than so many hours per week, etc.). This meeting generally gets repeated every time there is a major breakdown to handle. I would have new people experience these meetings by recreating the original meeting for them or, if possible, by having them watch a video of it. They should also be taken through any history of the team’s handling breakdowns in terms of what happened, how were the commitments renewed or modified, and what was the outcome. Finally, when there is another breakdown to handle, particular attention should be paid to the new people and the nature of their participation to make sure they authentically commit to the project and the team. As for being suddenly thrust into a leadership position, I assume this happens to a person who is already a member of the team. If not, the new leader should go through the steps I’ve outlined above. Other than that, I would have the new leader read this dialog (when it’s complete) and behave accordingly. Doug: In the case I described, above, it was about as far from what you lay out here as appropriate as possible. The leader was dismissed due to poor performance and I was brought in with no experience on the team and no subject matter experience whatsoever. There were members of the team who were convinced that they ought to have been the one appointed and more who were convinced it just should not have been me. All things considered, we were quite successful. The project was completed, on time and on budget and no one died in the process. We actually did many of the things you described. We discussed the committed outcomes both one on one and in groups and we asked for everyone to be clear on the commitments they had made and whether or not they were still committed. And then we set out to produce an extraordinary result and did. 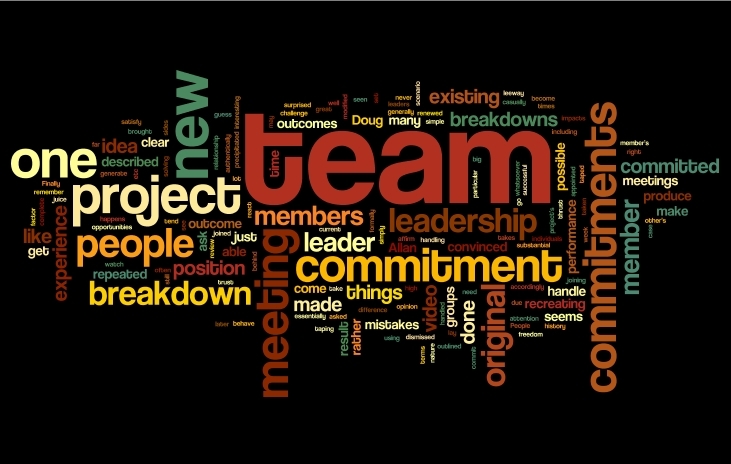 One of the things you point to that I have missed in the past is the idea that the meeting to review what a team is committed to can be repeated anytime a breakdown impacts the team. Many times leaders react to breakdowns as problems that need to get “fixed” right away rather than as opportunities for the team to come closer, refocus and proceed as a team. I like the idea of formally revisiting the original commitment. I tend to do that casually and with individuals rather than the whole team. And the idea of video taping the original project meetings is an interesting one as well. Have you done that or seen it done? What was the outcome? What other outcomes will satisfy this commitment? What is the commitment behind this commitment? Generally, I would do this after having the team, including the new member(s), affirm their commitment to the project and to one another’s commitments.